Spring is almost here, and to take the most advantage I have prepared a series of how to's for all things gardening, with special tips for all beginner gardeners and for those of you who only count with very little space for growing. 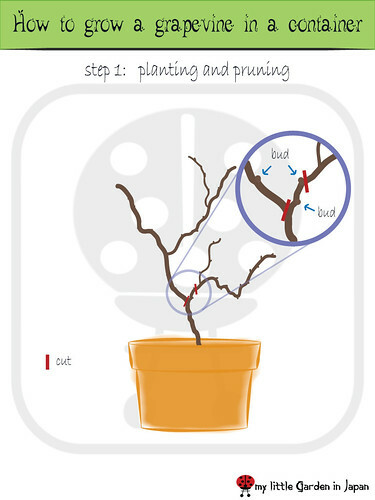 To start, I want to post about how to grow a grape vine in a container. I had a lot of great feedback on the day of the world garden carnival with my post about my own grape vine, and also I got a lot of mails about people who wanted to know more about how to grow them like that. Growing a grape in a pot is very easy to do and also very rewarding. There is just a couple things to consider: You have to make some planning and later keep the plant in check or else it can grow wildly and get out of control. Here is how I do it. I hope you find it useful! If you have further questions don't hesitate to leave a comment, send me a mail or a tweet. First a little check on the plant. Grape vines are very hardy are perennial plants, very nice and easy to grow in containers. They forgive a small dry spell and they can do well on poor soil. If they are trained properly they can take very little space. Grapevines are great for making a natural barrier or providing some extra roof in a pergola outside. And of course, the best of all is that they give very delicious fruit! There are hundreds of varieties of grapevines, and they can take a very wide range of climates. So chances are, if you want to grow them, there must be one perfectly suitable for you. One thing to remember though is that new grapevines take a little time to give fruit. So if you want to have one in your garden make sure you are in for the long haul. Grapes give fruit on second year wood. This means that the new branches that grow one season will be the ones giving fruit next season. Also, is important to remember finding an appropriate site to grow your vine; Grape vines appreciate having full-sun. Having a lot of sun will help them bare more fruit. Before anything you have to choose the type of grape you want to grow. Be sure to pick one that is adapted for your climate, that way the plant will have a much better chance of growing nicely. To make the picking of a variety easier, you can ask yourself a couple questions. What do you want to do with the vine?. Are you are after the fruit or just the leaves? What will you do with the fruit? Do you want to have a red or a green one? Once you have decided on those things you can ask in your local nursery or garden center for one that matches your description or just do a quick search online. In my case I have a pione, it is a seedless purple table grape, it has an amazing flavor and the fruits get to grow really big. It is one of the favorites to enjoy here in japan. The best time for buying new grape vines is around autumn, right after the harvests. That will give the plant a chance to grow its roots and get established in its new house before the dormant period. Now that you have your grape is time to plant it on a pot. If you need some instructions to help you, be sure to check the post about how to plant in a container in here. The process is basically the same as with most common plants. Get a nice layer of drainage for your container and some rich black good soil. Grapes can take having poor soil, but they do much better if they are feed properly. Be sure to separate the roots when you are planting. Grapevines like having a chance to stretch their roots, this will help them develop and settle much more quickly. Remember to put a layer of mulch to keep the weeds away and keep the temperature of the pot balanced. Once you have planted your grape keep it growing freely until the season ends. This will allow it to grow strong roots and establish in its pot. If you got it early in the season it might get a bit messy with all the new growth, so you can do a small pruning during summer to keep it small. When winter arrives your grape will drop its leafs and enter a dormant state. During this period it will need less resources, so be sure not to over water. By late winter, after the big frost but a bit before it starts growing again, it is time to the first big pruning. The best way to prune is to make a diagonal cut away of the bud, just a little over the same. Also, you can cut right into the middle of the joints of the cane. This last technique can work very well, but you have to make sure to avoid damaging the bud, which is sometimes tricky. The goal here is to trim your plant so only the two lower healthy buds remain. The bud is a small protrusion growing out of the trunk. It looks a bit like a mole or a small pimple growing from the bark. From these is where the new branches will grow. To help your vine grow neatly and under control you have to provide a structure for the vine to climb into. A sturdy trellis or wood frame will work well. You can form a small arch, a circle, make a stair shape, etc. There are many possible shapes you can try, let your imagination guide you. Depending on the size you grow, the trunk plus the leafs and the fruit can get a bit heavy, therefore the only requirement is that whatever structure you have must be strong enough to hold the weight of your vine. Also, make it with something that will last many years, since you will have it growing there long time. The next spring after you did the heavy pruning, one main branch will develop from each of the buds available. The task here is to keep them growing on the shape you want. 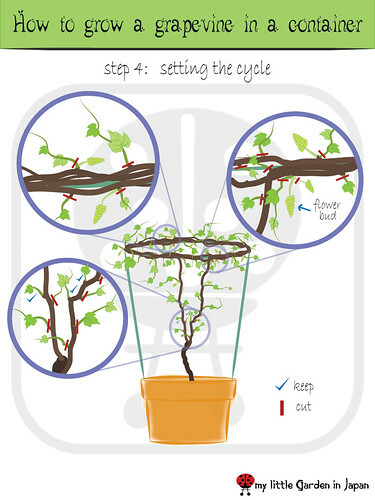 You can progressively tie your vine to the trellis as it grows, to maintain the form. Keep it on check regularly, especially during spring, because the vine can grow very fast. Because of the space restrictions on a container is best to keep only one or two branches growing (more if your container is big enough) thus is best to keep only the stronger branches. Prune away any runners that sprout from the core canes to give all the strength to the main vines. Once that your grape vine has reached the size you want, you can cut the tip of the vine to prevent it from growing further. The best fruit is given approximately from the sixth to the twelfth fruiting bud, so you can use this as a reference for the size of your grapevine. After the season ends, and the vine enters its dormant state once more, you will have a skeleton that will be the main structure of your plant. Right now, this is the step my grape is in. It can be a bit of effort to keep the vines in check, but I am sure the results will be worth it. This is the most crucial part of growing a grape vine. In order to keep the plant healthy and giving the most fruit over the years to come you must prune it periodically. Also, since fruit is bare in second year canes you must prepare one new fruiting branch every year. To help you do this is best to make a cycle of renewal, where every year a couple new branches will grow and substitute the old canes from last season. For this, every year, you have to prune away all the new runners and branches that grow from the top canes. Leave only a couple strong and healthy branches growing from the base and train them to grow into your structure as you did the year before. Also, every year, at the end of the season, prune away the old wood. All of those branches that gave fruit that year have to be taken away. The idea is that those new branches will substitute the last season growth as the new fruiting canes for next year. Once this cycle has developed, you can continue it for many years. That way you will always have the best fruit from your grapevine and it will grow into a very nice and healthy plant. During the fruiting season is a good idea to prune away any weak flower buds. This will help the plant concentrate its energy on the best flowers and give the best fruit. You should also take away any weak grapes growing in every bunch. There are a lot of possible grapes with every flower bud, if you take the smaller the rest will benefit and develop more and it won’t be noticeable. Grapes are amazing plants, they grow very easily even without much care, but is always good to feed them a bit of fertilizer around the spring to help them develop new canes, and also during the height of their fruiting season to help them grow more delicious grapes. Birds love having grapes as much as we do, so you might need to protect your grapes from them. Depending how much problems you have keeping the birds from eating all your fruit, you can use several methods. You can try small reflective material hanging or use a net to protect the vines. 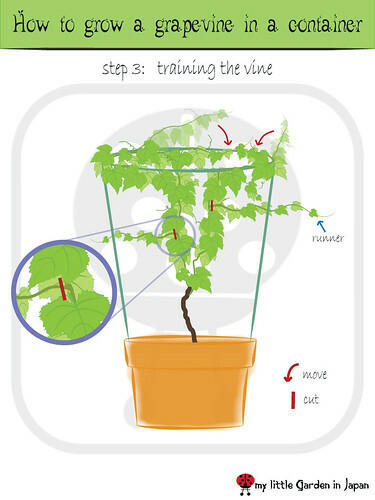 The new vines in a grape plant are very flexible and easy to manage; you can try making shapes or patterns while you are training them in their planter. Now remember, this is only one particular way of growing a grape in a container. There are a lot of other methods shapes, techniques and arrangements you can try. I have seen grapes growing and covering a whole balcony and have also seen a little small bonsai grape. You should try to see what fits best for your needs, and don’t be shy to experiment. After all, that is what gardening is about. And that is how you grow a grape vine! If you what to know more about growing grapes and other container gardening matters be sure leave a comment, send me a mail or a tweet. 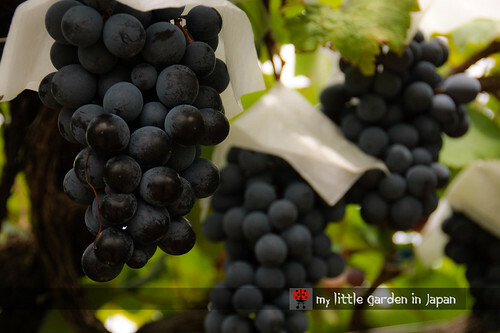 Have a lot of fun growing your grape vine! Fer, those illustrations are just wonderful! You should write a book - or get a job illustrating manuals! You make it all so clear and straightforward that I'm almost tempted to have a go myself, even though I have got lots of plans of my own (too many perhaps). I want to start one now, haha but I think I'm overly ambitious this year. Outstanding post! The diagrams really help to explain it. Thank you! Hi Fer, Thanks so much for sharing this great post! I already start my grape vine, since I read your post last time. I bought 2 plants from Thailand, but one of it seems not so happy at my garden. Fantastic! I never thought to grow grapes in a container! Now I have to stop at the store again tomorrow. They had some grape plants but I didn't know where to put them, now I do, lol. Wish growing grapes was that easy here. There are a few ultra-early varieties (110-130 frost free days) that can be grown on the Canadian prairies but I haven't taken on that balcony garden challenge yet. 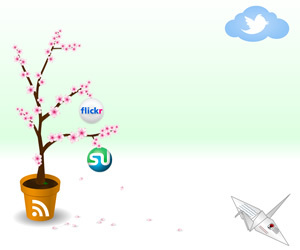 Please post photos as your vine grows and sets fruit this summer. Looking forward to seeing how much you can harvest from the container. Thank you! is great to know the illustrations are good. It took me some time to make them, but I am getting the hang of it more and more. This post is great! And the illustrations are fantastic. Thanks, Fer! I am just wondering, as I have a vineyard, all my grapes are growing only on new vines, and not the 2 year-old ones. So, I guess there are maybe different varieties? I prune my vineyard every year and leave 2 or 3 buds, like you explain. It will be interesting to see the amount of fruit which your container vine produces. Some comprehensive instructions there which I'm sure will help anyone growing vines. Nice explanation.I like to try in my garden. Fer that is an excellent post! 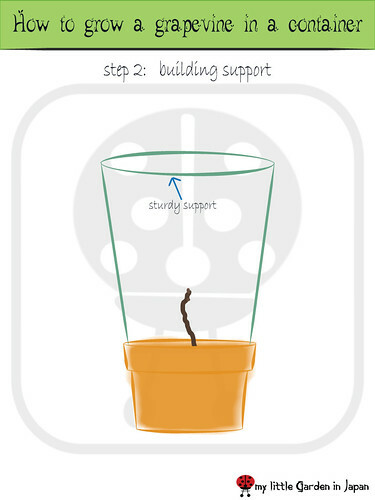 I can imagine a lot of people taking inspiration from it and using it to guide their own vine growing experiments. I shall certainly be saving it so that if we decide to try vines in the future I can easily refer back to it. so informative... I am inspired to try this. I have one large container that always gets too much sun and so far no plant has enjoyed living in it. I really want to try this. I'll keep you posted. I have booked marked this entry for future reference. Very detailed and clear illustration. I was given a beautiful pot of grape vine a few months ago. The plant is disappearing slowly but surely. I think I'm better at growing bugs. Fantastic post! You have put so much hard work into it, I'll be sure to 'pick' you on Blotanical! These are one of the first crocuses wo bloom. (Crocus tommasinianus), they are really nice. You should try them in your little garden in japan :) It flowers the same time as snowdrops. After that the "normal" Crocuses bloom.. Excellent posting, fer. I think everyone should expand their horizons through your tutorial. Nice tutorial and illustration Fer! Grapes that almost black in colour can warm up you tummy really fast if you consume a lot of it. I am not use to it so I usually pick the green variety a lot whenever I went budogari picking in Japan. 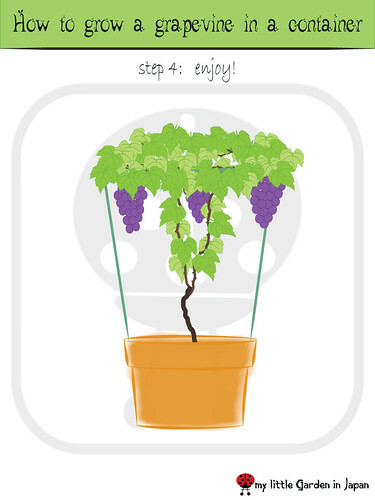 Such a useful tutorial to refer to when I get ready to plant some grapes! Thanks for that great informative post! As others have said before, your illustrations are absolutely amazing! They are really clear and accurate and yet very pretty. You really should be doing the graphics for gardening books! Very nice "how to"....you really should write a book. I like knowing that so many things can be grown in pots! A most thorough descrition--container gardeners all over the world will be thrilled. Fascinating! I didn't even realize you could do that. And the illustrations are perfect! Thanks for sharing your experience with grapevines! Thsi is excellent post of grape planting! I wish to have grapes in my garden one day! what a great post! i love your little diagrams... such pretty dark grapes, too. Great information, Fer! Not everyone has room for grapevines, so the idea of growing one in a container is such a great idea. The hard part must be having the patience to wait for some of those delicious-looking fruit! Wonderful illustrations! You are amazing! I didnt know grapes can be grown in a pot! I had one, two years ago and he died. I don't why. I will try, your way and I hope I will have some grapes to eat. Nice post ans easy to understand. Thank you very much! It is a lot of encouragement seeing that the tutorial is useful. Now I will try making many more. Orchid de dangau ~ Good luck growing your vine! keep us posted on how it goes. vrtlarica ana ~ Yes they have some varieties that have fruit on their first year. I hope yours continue to grow nicely. lifeshighway ~ I am sure a grape will grow perfectly there. They can take the sun quite nicely. You inspired me to try. I now have a pot with grapes. I hope they survive long enough for me to harvest fruit. I love the look of your website. I recently built mine and I was looking for some ideas for my site and you gave me a few. i have just planted my grape vine. maybe not the right time of year, but i found them in the home center, to here i go! i am so happy to have found this post. 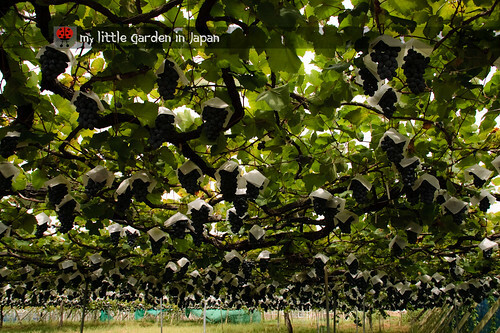 bookmarked, so hopefully i can grow my own grapes! Lovely illustrations - very inspiring! Could you please provide some more detail as to the support itself? Did you make it? If so, how? My three year old vine which I thought securely staked has just been knocked over by a recent storm so I am anxious to replace it and your circular contraption looks great. Any details you can provide would be very gratefully received. Thank you. Thank you for this information! I just received a grape plant for my birthday and had no idea how to care for it. Your instructions and illustrations were very helpful! Gracias por tus fotos y tus anécdotas. Estoy investigando para plantar uvas en maceta... Seguiré tus consejos... Gracias y saludos desde la ciudad del sol!. I was inspired to try using your instructions. It's now summer and the vine is growing well but I don't know what to feed it, when, and how often since it is not in the ground. That would be very helpful to know. From your images a container grape vine should have a circular trellis? If so, how large should the diameter be and how often do you prune during the summer aggressive growth to keep them in line? Thanks! i found the round trellis to work for me, but i think you can put then any shape you want, i have seen them square and also growing to a wall. About the pruning, i think the only important part is to leave one or two branches for the fruit and then all the you can prune anyway it fits your plan. It is good to be read and who else will read it he will definitely get many more. I would like to have cutting seed of this Grape, also I sent email to you with my yahoo account. These will be great to start in the backyard and it will not even be that hard. I’m going start this in my backyard and let you know the feedback later. Hi, I'm planting a vine in a plastic paint container. I see some tendrils coming out. I was wondering how to put in support stakes for the leaves. I see from the picture that yours is a circle at the top. What did you use as the support stalks and the 'hoop' at the top? Thanks for the post. Great ideal. I never thought of growing grapes in a container before. What size container would you suggest (minimum size)? Thank you for your great tutorial. But how large should the container be? It's so clear and helpful.I wish I had read it eralier. Thanks for this tutorial. The circular trellis looks like a good way to utilize space. When someone wants to grow grapes without having a lot of garden space, this is ideal. I have never tried to create a circular trellis but it should be fairly easy to do, once I set my mind to it. I think that would be the most difficult part of growing grapes in containers. Thanks for tutorial. I used to think you need lots of space to grow grapes and make vine. Thank you for the inspiring post! I have a few practical questions: we live in the middle of Europe (Budapest, Hungary), with generally warm summers (~30C) and mild winters (0..-10C, sometimes goes below -25C at night for a few days). The question is if I should be afraid of winter freezing, what can I do about it, and how big the pot should be to grow grapes of 2-3 meters size (I'd use a little pergola or similar)? The grape is a local one with big yellowish delicious fruits, sometimes the bunch reaching 1kg. This will be a rooftop pot, with a lot of sunshine and some wind. How much watering does it require? Thanks again for the excellent writeup! 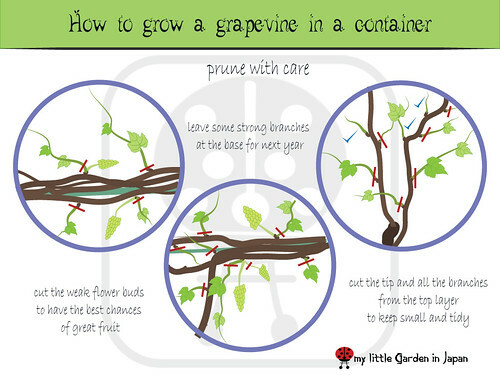 i prune my grapevine..just today when i read this blog..and i will keep posting,if it really helps.lets find out..
Its just wonderful information. 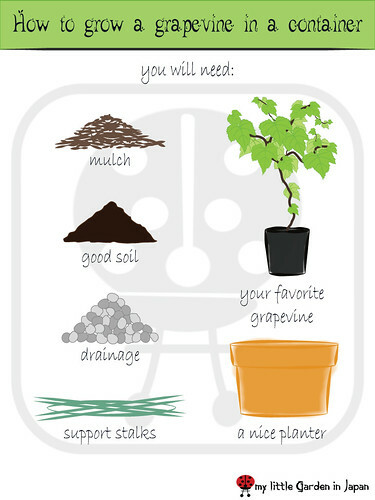 really helpfull for the people who are carrying gardening as a hobby. Growing a grape in a pot is very easy to do and also very rewarding. I would be trying to do this, That's really nice searching for me, Keep sharing like this..
Thankyou for the post. A great description for the beginners which have have less space other than terrace. I am a good rooftop vegetable cultivator, but have no experience in growing grapes. This is actually an excellent guidance for those who have passion for growing grape wines. Hi Fer, I am just starting out with growing my grapes indoors. Is there a certain size of structure or trellis you would recommend starting with? What do your plants look like? So cool, I'd love to be able to grow my own grape vine but I always thought it would be quite a project! Fer, I purchased 5 concord grapevines and 2 Niagara grapevines, I dug 6 holes along a post and rail fence. Each hole Iso centered between the posts of that rail, which is what will be the structure that supports the vines in the future. My problem is, we've had 2 weeks of rain in our area (southeastern Pennsylvania) during the end of April and the beginning of May. 4 of the 6 holes are full of water, they've been full for the better part of a week now. My concern is, this is a common occurrence, water draining from higher ground, I still want to use the location, but fear this poor drainage will be detrimental to the 4 vines I plant there. So, my solution is to fill in the 4 waterlogged holes and plant the vines in that location, in very large containers on the surface. My question to you, am I worrying over nothing, concerning the water drainage or should I go the container route? Thanks, g in pa. I hope you got to solved your rain problem and the grapes are doing well now. I think maybe they would have suffered in the beginning with too much water, but if they survived they should be growing nicely now. I found you on Pinterest! After while looking the easy understanding language to follow hahaha. What a great tutorial for someone like me with no gardening experience where only passion to grow chasing me and now is the time. I just bought 4 young grape plants with 2 different varieties, they looks healthy 2 weeks from shipment. Thanks for sharing it, which is easy to understand and follow it. I do not have a lot of place in my garden for grapewines. I did not even know about growing grapevines in container. I have to try it. Thank you. I have a cabernet sauvignon in a pot. This is a great idea!! I have a cabernet sauvignon in a pot. This is a great idea!